Srinagar, July 06 (KMS): In occupied Kashmir, the puppet authorities, today, did not allow to offer Friday prayers in historic Jamia Masjid in Nowhatta area of Srinagar as restrictions were imposed ahead of the second martyrdom anniversary of popular youth leader, Burhan Muzaffar Wani. Srinagar, July 06 (KMS): In occupied Kashmir, the Chairman of Jammu and Kashmir Peoples League Chairman (JKPL), Mukhtar Ahmad Waza, has said that settlement of the Kashmir dispute in accordance with the aspirations of the Kashmiri people is essential for ensuring permanent peace in the region. Srinagar, July 06 (KMS): In occupied Kashmir, the Joint Resistance leadership comprising Syed Ali Gilani, Mirwaiz Umar Farooq and Mohammad Yasin Malik, taking a strong note of shifting Aasiya Andrabi and her two associates to Delhi, has called for a complete shutdown tomorrow (Saturday). Indian troops had martyred Burhan Wani along with his two associates in Kokernag area of Islamabad district on July 8, 2016. Burhan’s martyrdom had triggered mass uprising against the Indian occupation in Kashmir and the men in uniform had killed over 120 civilians to suppress the uprising. Srinagar, July 06 (KMS): In occupied Kashmir, the Chairman of Jammu and Kashmir Muslim Conference (JKMC), Shabbir Ahmed Dar led a delegation which included International Forum for Justice Chairman Mohammad Ahsan Untoo, Arshad Ahmed and Majid today visited Ladoo Pampore and expressed solidarity with the family of young boy Faizan who was martyred by Indian forces at Pulwama. Srinagar, July 06 (KMS): In occupied Kashmir, the authorities have detained many Hurriyat leaders to prevent them from participating in various programmes announced by the Joint Resistance Leadership in connection with the 2nd martyrdom anniversary of popular youth leader, Burhan Muzaffar Wani. Srinagar, July 06 (KMS): In occupied Kashmir, the second martyrdom anniversary of the prominent Kashmiri youth leader, Burhan Muzaffar Wani, will be observed on Sunday with the reaffirmation of the people’s resolve that the Kashmiri martyrs’ mission will be accomplished at all costs. 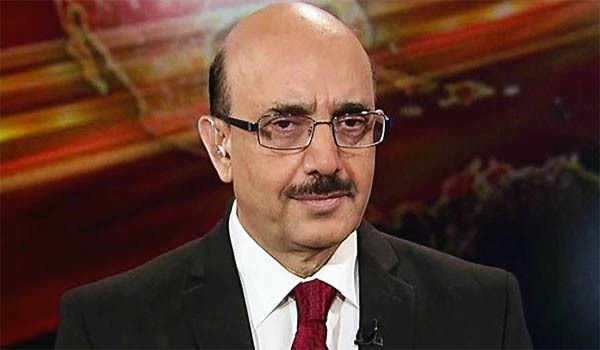 Toronto, July 06 (KMS): The President of Azad Jammu and Kashmir, Sardar Masood Khan has urged the Canadian Senate, House of Commons and Ontario Legislative Assembly to raise and discuss the Kashmir dispute and send a fact-finding mission to occupied Kashmir and Azad Kashmir to help in finding a resolution of the lingering Kashmir dispute. Srinagar, July 06 (KMS): In occupied Kashmir, the Human Rights Commission has sought reports from deputy commissioners of Islamabad and Kulgam districts on separate petitions, seeking directions to find real facts into the killing of two civilians at Srigufwara and Chader areas, last month. Srinagar, July 06 (KMS): In occupied Kashmir, the All Parties Hurriyat Conference General Secretary, Ghulam Nabi Sumjhi, has expressed serious concern over the arrest spree unleashed by the Indian forces and cautioned the authorities to end the reign of terror in the Valley.